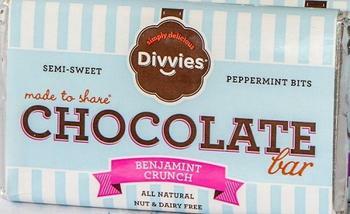 Divvies is recalling its Benjamint Crunch Chocolate bars that were sold online through its website. The peppermint used in the bars may contain milk, an allergen not declared on the label. There have been no consumer complaints regarding the product. The company is contacting customers who purchased the recalled product by phone or email. Consumers with questions or concerns may contact the company at 844-434-8843, Monday – Friday.